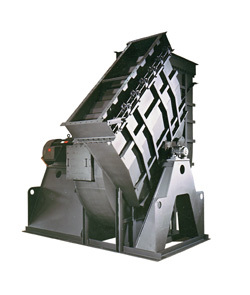 Products : Chicago Blowers : AF/BC Custom Heavy-Duty Fan - Draft Air, Ahmedabad, Gujarat, India. The two most important criteria when specifying a custom heavy-duty fan are efficiency and reliability. Air handling systems are increasing in complexity with the addition of more restrictive emission controls and air cleaning devices. While the results have been a cleaner environment, system pressure requirements have risen significantly. As these requirements increase, greater levels of energy are needed to force the air or gas through the system. Operating efficiency of the fan has become much more critical. Every dollar saved on the purchase of a less efficient fan will be consumed in additional operating costs. Maximum fan efficiency will not only have a positive impact on the bottom line, it will have a positive impact on the environment. Greater fan efficiency results in lower power requirements and fewer natural resources consumed. Efficiency also influences sound levels. The more efficient fan will run quieter than the less efficient fan. The quieter fan will need less sound insulating materials, or none at all. To cover the widest range of system requirements, Chicago offers a full family of airfoil and backwardly curved fan designs with overlapping performance envelopes. To maintain high efficiency and maximum economy, the systm's pressure and flow requirements are matched to one of eleven wheel designs with varying rotor widths and diameters. The selected fan is then sized to exact duty requirements. No more, no less. Wheels are available with either Chicago's proven hollow airfoil blades for clean air, or solid backward curved or backward inclined blades for dusty, dirt applications. With eleven rotor designs, custom sizing and duty matching blades, Chicago will build the fan to meet exact system performance specifications.